The Big Momma 6,500 sq. 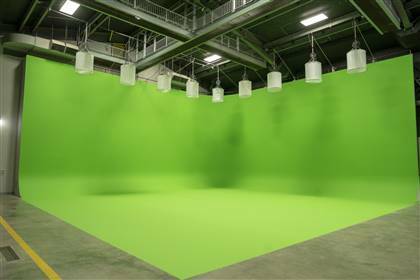 ft purpose-built soundstage features an assortment of amenities for your next production. Home to the largest hard cyclorama wall in Texas, standing at a massive 50’ W x 50’ L x 24’ H.Prelit with nine Mole-Richardson Vari-Space LED lights thanks to our partnership with Cinelease . Each light only takes 900W and can adjust from 2700°K – 5600°K using an accompanied iPad. Driving your 10-ton grip truck into the stage is convenient using our 14’ W x 18’ H bay door. Power is distributed between our 800 amp cam lock and the 400 amp cam lock on our catwalk. Building B also contains four production suites, coming outfitted with ethernet 1 GB connection, each with a full private bathroom and enhanced cellular service.